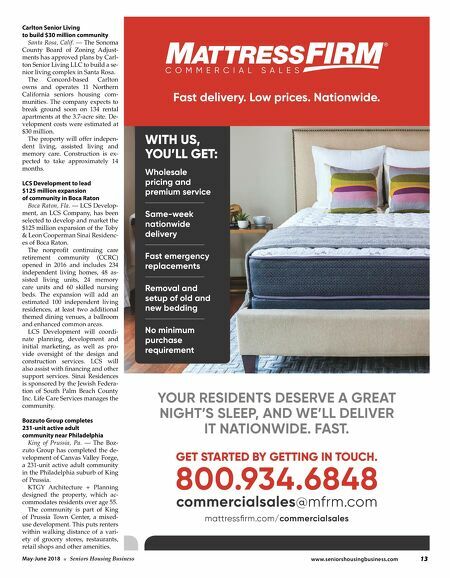 www.seniorshousingbusiness.com 13 May-June 2018 n Seniors Housing Business commercialsales@mfrm.com mattressfirm.com/commercialsales YOUR RESIDENTS DESERVE A GREAT NIGHT'S SLEEP, AND WE'LL DELIVER IT NATIONWIDE. FAST. GET STARTED BY GETTING IN TOUCH. Fast delivery. Low prices. Nationwide. 800.934.6848 Wholesale pricing and premium service Fast emergency replacements Removal and setup of old and new bedding Same-week nationwide delivery WITH US, YOU'LL GET: No minimum purchase requirement Carlton Senior Living to build $30 million community Santa Rosa, Calif. — The Sonoma County Board of Zoning Adjust- ments has approved plans by Carl- ton Senior Living LLC to build a se- nior living complex in Santa Rosa. The Concord-based Carlton owns and operates 11 Northern California seniors housing com- munities. The company expects to break ground soon on 134 rental apartments at the 3.7-acre site. De- velopment costs were estimated at $30 million. The property will offer indepen- dent living, assisted living and memory care. Construction is ex- pected to take approximately 14 months. 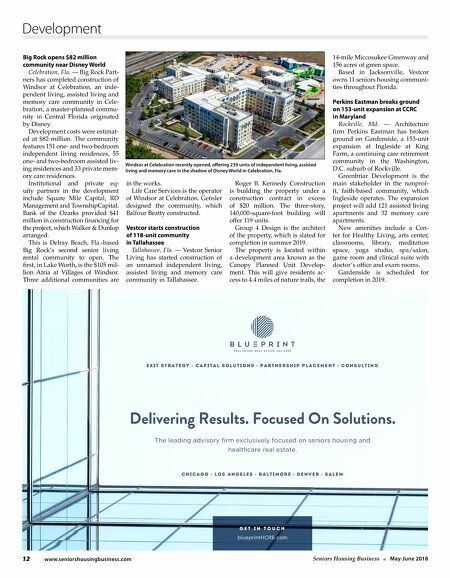 LCS Development to lead $125 million expansion of community in Boca Raton Boca Raton, Fla. — LCS Develop- ment, an LCS Company, has been selected to develop and market the $125 million expansion of the Toby & Leon Cooperman Sinai Residenc- es of Boca Raton. The nonprofit continuing care retirement community (CCRC) opened in 2016 and includes 234 independent living homes, 48 as- sisted living units, 24 memory care units and 60 skilled nursing beds. The expansion will add an estimated 100 independent living residences, at least two additional themed dining venues, a ballroom and enhanced common areas. LCS Development will coordi- nate planning, development and initial marketing, as well as pro- vide oversight of the design and construction services. LCS will also assist with financing and other support services. Sinai Residences is sponsored by the Jewish Federa- tion of South Palm Beach County Inc. Life Care Services manages the community. Bozzuto Group completes 231-unit active adult community near Philadelphia King of Prussia, Pa. — The Boz- zuto Group has completed the de- velopment of Canvas Valley Forge, a 231-unit active adult community in the Philadelphia suburb of King of Prussia. KTGY Architecture + Planning designed the property, which ac- commodates residents over age 55. The community is part of King of Prussia Town Center, a mixed- use development. This puts renters within walking distance of a vari- ety of grocery stores, restaurants, retail shops and other amenities.